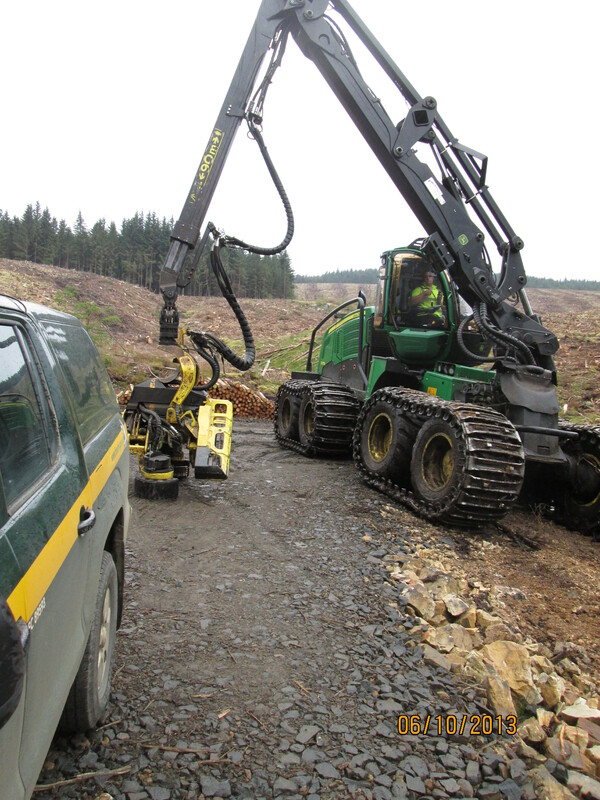 Megan and I were offered a look into the innards Kielder Forest (the largest man-made woodland in England) by forestry manager Simon, hubby of Fiona who works with us at the B&B. Simon knows this forest like the back of his hand; and we are talking about an immense 250 square miles (650 km2). (from Wikipedia)United Kingdom Forestry Commission, initiated the first plantings in the 1920s. During the 1930s, the Ministry of Labour supplied men from among the ranks of the unemployed. Many came from the mining communities and shipyards of North East England. Note: Forestry manager Simon said much of the forest was also planted by Polish refugees from the war who worked to earn money to return home to Poland. Also, there was a “shelter/art work” and I use the term “shelter” loosely because on this day it wasn’t a shelter, it was a wind tunnel. It works as Art, but not as a Shelter this day. 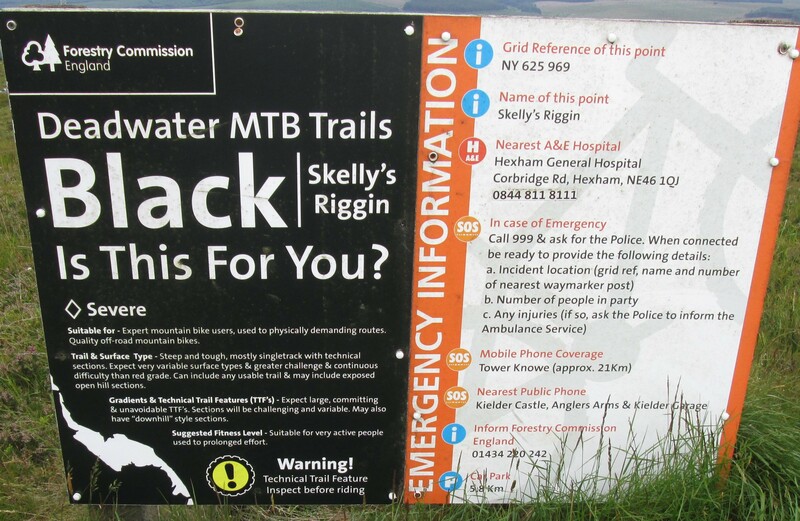 This area is part of the downhill single track mountain cycling route. The old road to the Castle starts here and I am told by a local cyclist that it takes approximately 12 minutes to get from 1,900 feet to the castle which is at 650 feet. Fast ride, eh? Notice the “emergency” contacts. This is not for sissy’s. 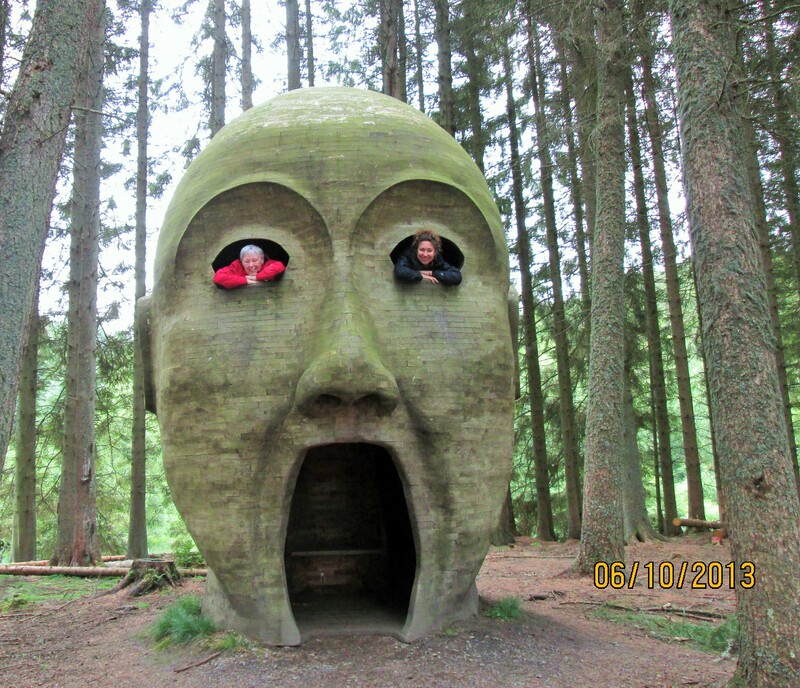 Forest Head: This is an excerpt from The Telegraph newspaper about the art. If you could see this in person you would see that it is constructed of small blocks of wood which have been precisely cut to fit the curves of the sculpture. Simon assisted on this project because of his talent for chainsaw sculpting. For those of you who got my photos of the “skewed construction” of the railway viaducts, here is another example. Nose close-up foto. Simon then took us to look at the Janus Chairs and the Kielder Dam. Then the real trip into the forest began. And, this is where we stopped. 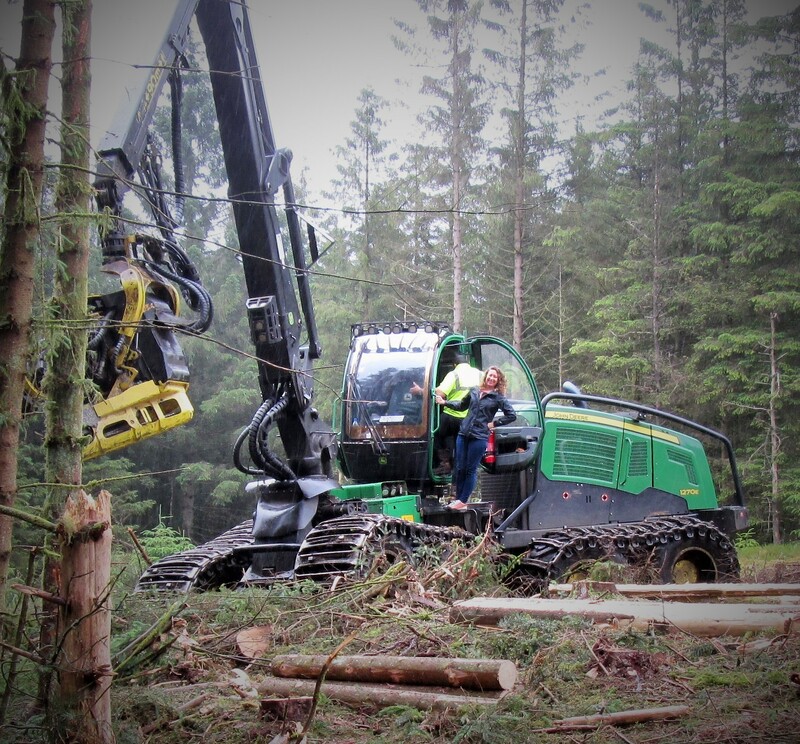 Simon is giving us the opportunity to operate this John Deere worth 40 million British Pound ($62,453,591.48 USD) logging machine – is he out of his mind??? But, we jumped at the chance. Operator Neil was calm on the outside – not sure what the hidden emotions were! This was NOT on my bucket list, but I added it when I got home. The forest is one of the last English strongholds of the European red squirrel. It provides excellent habitat for many species of birds of prey. In 2009 a pair of osprey nested successfully in the forest. 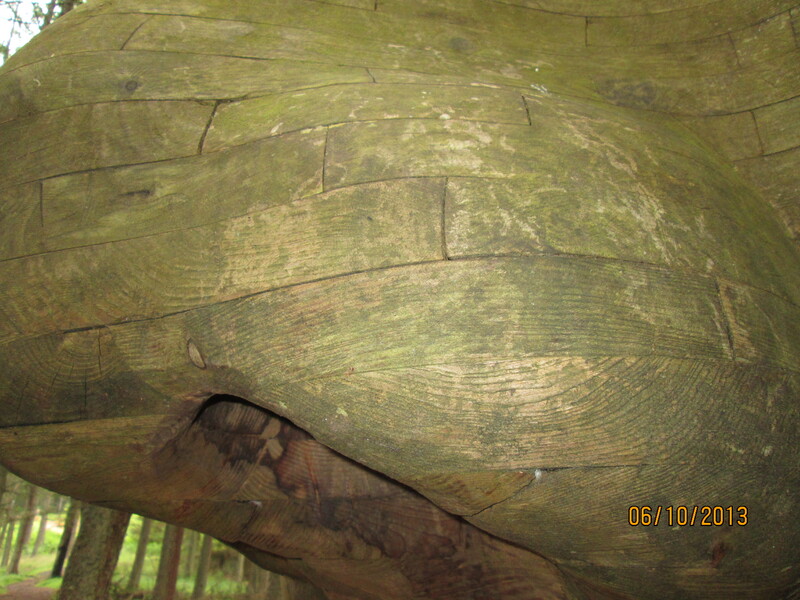 This pair have continued to nest there each year since, and a second pair nested in the forest in 2011. A large population of roe deer is actively managed. Many archaeological remains can be found within the forest and are an important cultural link to the often turbulent history of the area. Wave Chamber, a camera obscura in a stone cairn by Chris Drury. 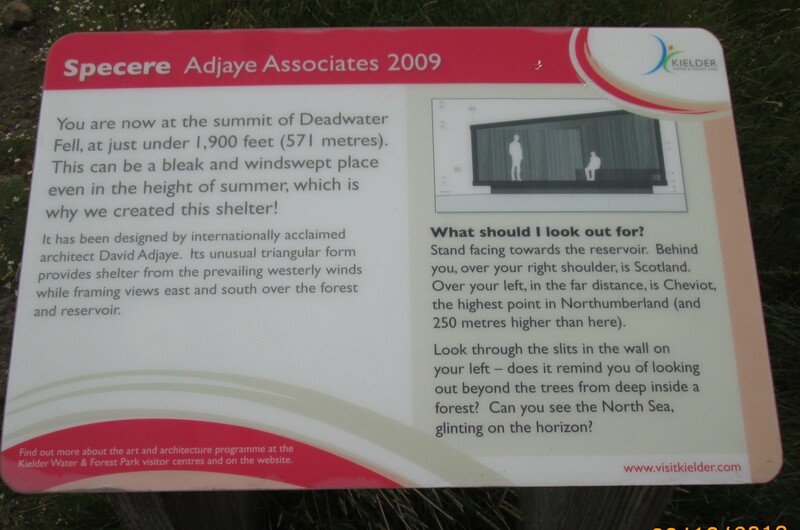 The forest also contains Kielder Observatory which is an astronomical observatory. 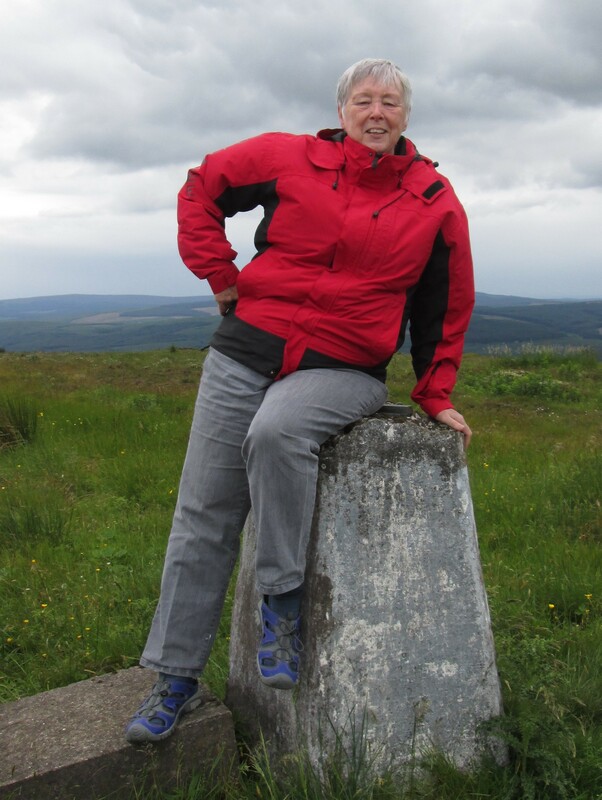 In 2010, former British distance runner Steve Cram inaugurated the Kielder Marathon which is a circuit around the lake taking in the surrounding gentle contours. 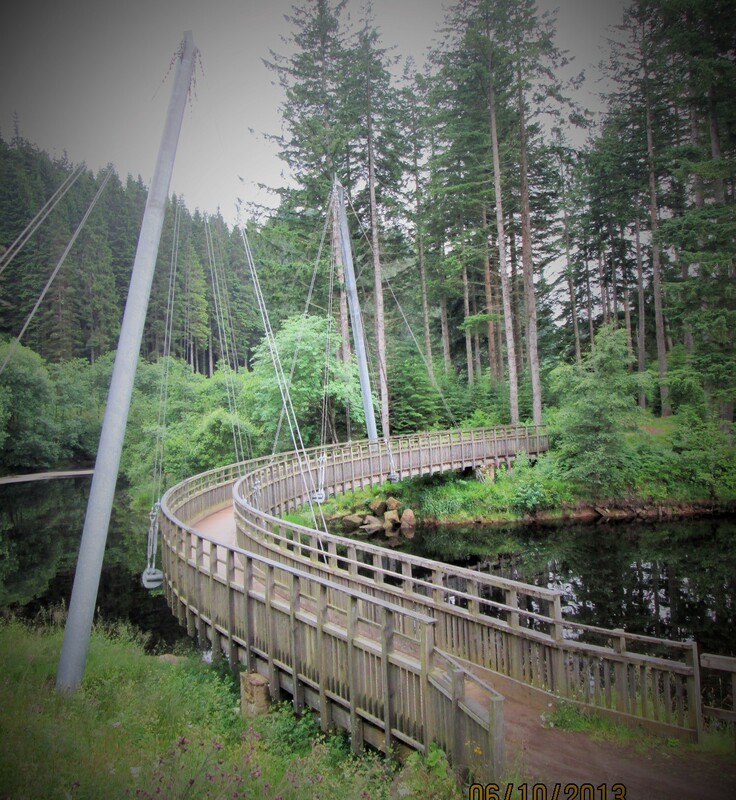 Last stop is the Millennium Bridge, suspended by cables, built by the Forestry Commission for which they received an award; and used for the Kielder Marathon. Hope you all enjoyed the trip as much as we did. < Previous Have You Read Any Good Books Recently? Next > Victoria Sponge … What’s That? We’ll miss having you around. Good luck on your travels. I’ll be waiting on all your posts to see what you’ve been up to.